Two former Accelerated Christian Education (ACE) students who have never before spoken publicly have made new allegations about sexist and creationist teaching in the schools. I came across a lot of sexism. I remember as a girl finding it quite shocking. We were taught that if you’re a woman, you should be subservient to men; your husband, your pastor and other male figures. There was a strong culture of men being revered and women being dangerously sexual and having to cover up. It made me self-conscious of being a woman. A huge amount of time and effort was given over to arguing against evolution and for creation, it’s a fundamental building block of the curriculum. The curriculum is stuck in the past like the rest of the fundamentalist southern Baptist churches it was born out of. It taught me men were superior to, and should be in charge of, weak women, that the various different ethnic and social groups were ordained by God to have different roles and positions. 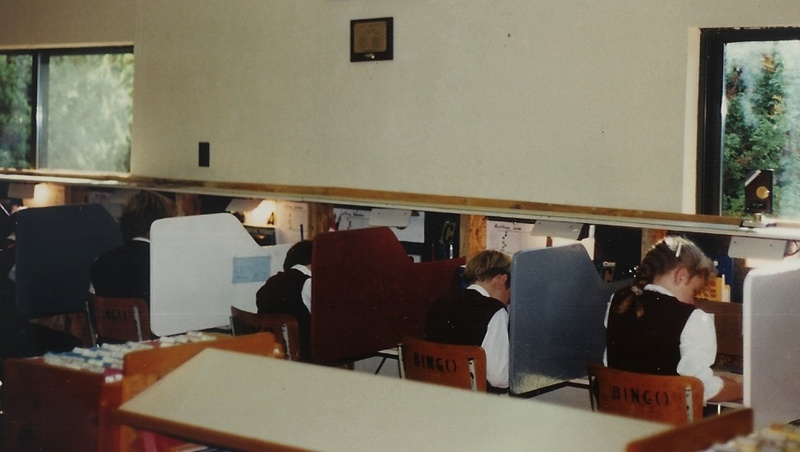 We sat at our desks which were arranged around the outside of the room, with boards that slid in called ‘dividers’ that sectioned us off from the pupil either side. We were not allowed to talk or interact with each other. To interact with staff, we had two flags. We would raise one flag for run-of-the-mill queries like asking for help with a question or a toilet break, and other one to signal that we were ready to take a test or needed input from the class teacher. If we put our flags up too often we would be told off. There’s also a photo (see above) from inside an ACE school, which I reproduce here with permission from its owner (who sent it to me with the filename ‘Alcatraz’). The article repeats points that will be familiar to readers of this blog but news to most UK citizens: the workbooks used in ACE schools include condemnations of homosexuality, encourage unquestioning obedience, teach the role of a wife is to obey her husband, and describe the theory of evolution as “absurd”. I know that the journalist, Siobhan Fenton, spoke to at least five other former ACE students, some of whom have never spoken out before, so from my point of view it’s a shame more of what they said was not included. Still, it is an encouraging sign that more ACE ex-students have broken their silence, and that stories about ACE no longer rely on me as a sole critical voice. Hopefully this will be the start of former ACE students speaking out in larger numbers—including those with positive views. There needs to be public debate about these schools, and every voice should be heard. I have read numerous Ofsted reports in the course of my research, and the issues most commonly raised by former ACE students are almost never mentioned, let alone satisfactorily addressed. In allowing ACE schools’ failings to go unchecked for decades, the government has failed in its duty of care to students in ACE schools. In future, inspectors should be specially briefed on the issues frequently found in ACE schools.